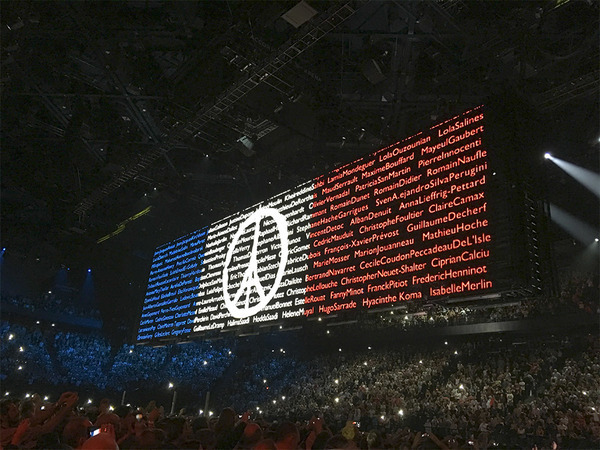 An emotional night in Paris as the band returned to France, three weeks after the devastating terrorist attacks. 'Oh, you look so beautiful… in this city of lights…' and never more so than at the end of City of Blinding Lights, as images of Paris on the huge screens gave way to the names of those who lost their lives. The massed cheering in solidarity was one more sign of an extraordinary atmosphere of celebration and defiance tonight. As Bono had said, introducing Iris, it felt like the whole world was in the city. 'Tonight we are all Parisiens. What a show, all the way from The Miracle (Of Joey Ramone) to One and Bad and the surprise arrival on stage of Patti Smith and 'People Have The Power' to close a remarkable evening. More on the show coming up but if you were in the house tonight tell us what it was like and add your photos here.